Located in Bali’s central highlands, Bedugul is much cooler than the rest of the island and awash with natural beauty. Here you will find misty mountains, cobalt crater lakes and lush fields and forests. This comprehensive Bedugul tour takes you on a journey of discovery around this amazing area and beyond. Your tour starts with a trip to the Butterfly Zoo in the village of Wanasari. Here you can see thousands of indigenous butterflies flitting around a beautiful garden. After that we’re off to the spectacular Pura Luhur Batu Karu temple perched on the slopes of Mount Batu Karu, one of Bali’s major mountains. For more incredible views, we head to the Jatuluih rice terraces. This UNESCO World Heritage Site features hundreds of emerald green rice paddies that spill down the sides of the foothills and out towards the sea. On a clear day you will be able to see Mount Agung and Mount Batu Karu in the background. Skipping over to Gunung Pohon (Forest Mountain), we will explore the biggest botanical gardens on the island with over 500 different species of orchids, as well as a traditional Balinese fruit market. Then we make our way Pura Ulan Danu Bratan, a lakeside temple that you may recognize from multiple postcards and the Indonesian 50,000 Rp note. After a relaxing lunch we will visit Lake Buyan and a coffee and clove plantation, before ending our tour with an easy hike through the rice paddies to Gitgit Waterfall. Here you can take in the sight of the cascading falls and cool off in the refreshing pool below. Located in the village of Wanasari, this is one of the best butterfly parks in the world. Here you can see thousands of indigenous butterflies, including spectacular bird wings. Gunung Batu Karu (elevation 2,276 meters) is one of the three major mountains of Bali, and it is the holy peak of West Bali. Here we will visit the temple of Pura Luhur Batu Karu with its beautiful panoramic views. This temple was the primary temple of the traditional Kingdom of Tabanan. Bali is famous for its amazing sculpted rice terrace ravines, and out of all the rice terraces on the island this is the most unforgettable. Recognized as a UNESCO World Heritage Site, this area features hundreds of lush rice paddies spilling down the side of the hills. Look south and you can see the sea in the distance, or north to soak up views of Mount Agung and Mount Batu Karu. Spanning over 120 Hectares on the lower slopes of Gunung Pohon, the botanical gardens are home to an extensive array of flowers and trees, including around 500 different species of orchids. Also nearby is a fine example of a traditional Balinese fruit market. Here we will visit the immaculate gardens of the Pura Ulun Danu Bratan temple with its beautiful views of the surrounding lake and mountains. This temple, dedicated to Dewi Danu (Goddess of Water), dates back to the 17th century and reflects both Buddhist and Hindu influences. AFTERNOON OPTIONS (please choose one of the following options for the afternoon of your tour date). If time permits we can try to go on to the second option. Another spectacular vista, this is also a popular stopping point for those interested in the agriculture of Bali. 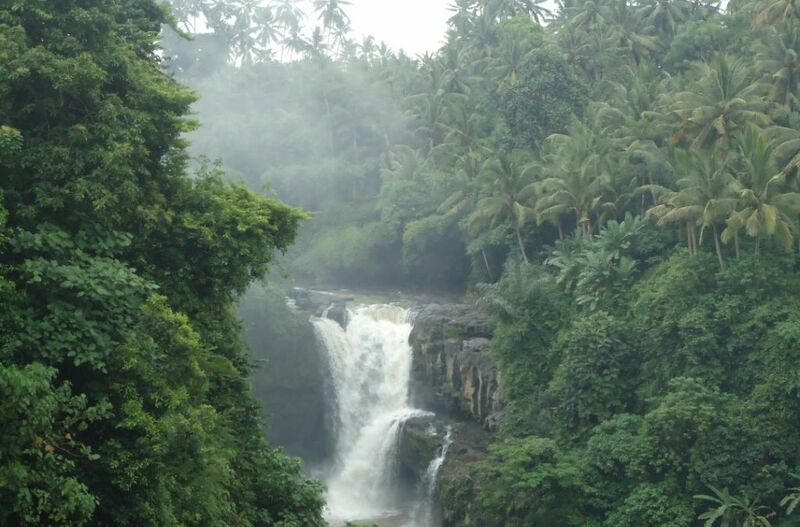 Around eleven kilometers south of Singaraja, the Gitgit falls are some of the highest and most beautiful in Bali. We arrive at the falls after an approximate twenty minute walk through beautiful rice terraces.